The benefits of the drip system are listed on the Garden Watering Systems page. A drip system is the best way to water your garden. The drip system uses a flexible pipe that has little holes in it. The pipe runs right next to the plant’s stem. The water flows out of the holes and waters the plants. Each hole has an emitter that controls the flow of the water. You can purchase the pipe with the emitters already installed by the manufacturer, or you can manually put emitters into your own pipe. These flexible hoses are connected to a manifold that feeds several hoses at the same time. Use a one-inch plastic pipe for the main manifold. You can have a shut off valve that is manually controlled or automatically controlled. Note: If you want to be able to turn off an individual riser, you’ll need to put an inline control valve in that riser. The control valve can be placed anywhere in the pipe or hose. It will control the water flow from that point forward. Space your risers (rows) about three-feet apart. Each one of these risers connects to the manifold. Note: you can use a splitter to run two drip lines off the same riser – See Picture. When installing a drip system, the main manifold feed pipe can be buried in the ground. To do this connect a ½” male threaded riser pipe to the 1” slip x 1” slip x ½” female thread - PVC Tee. This makes the water accessible at ground level. The picture shows the connection of the riser pipe to the emitter drip line. You don’t have to bury the pipe. You can lay the manifold on the ground. If this is the case, you’ll need to remove the main manifold feed line each season so you can rototill the ground and keep the pipes from freezing. 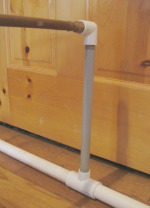 In either case the flexible drip pipes should be connected in the spring and removed each fall. How many lines should come off one manifold? That will depend upon the pressure and volume of your water source. Just 2 valves will control my entire garden 100’ X 50’. Cut the 1” PVC pipe in three feet sections. Glue the pipe to each side of the 1” slip x 1” slip x ½” female thread - PVC Tee. If you’re going to bury the manifold, screw the 12” riser to the ½” female tread. If you’re going to lay the manifold on the ground skip to step #5. Screw the threaded elbow onto the riser. Screw the drip line adapter to the threaded elbow (manifold buried) or the PVC Tee (manifold ground level). Slip the drip line hoses onto the adapter. Cut the drip line hose the length or width of your garden. 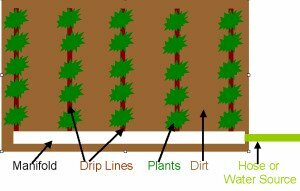 If your garden is on a hill, run your drip lines parallel to the bottom of the hill. Put a drip line adapter and a cap at the end of each hose, or you can bend it over and wrap it with duct tape.